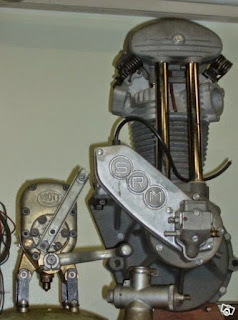 SRM Speedway Engine built from NOS parts and completed with new made parts from original pattern by well known Husqvarna V-Twin replica fabricator Gösta Svensson. The Engine has never been started. SRM stands for Svensk (Swedish) Racer Motor and they were constructed by Folke Mannerstedt made in small numbers in the late forties. The use of magnesium made the engine very light, about 10 kilos less than the JAP speedway Engine but it was a bit fragile. Norwegian driver and tuner Basse Hveem was probably the most successful user and took many victorys in Scandinavian Long track races with his SRM, he was called the "King of Solvalla" after numerous wins at the biggest race in Sweden. It is equipped with a BTH magneto, carburator is missing. Drott Long Track or Ice Racing 2 speed gearbox, NOS, never used, 950 euro, the Drott gearbox is sold, no longer available.